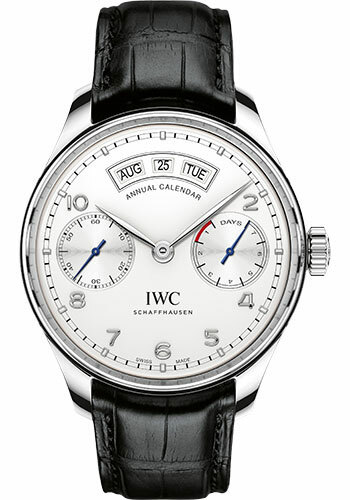 44.2 mm stainless steel case, 15.3 mm thick, sapphire back, sapphire crystal with arched edge, antireflective coating on both sides, silver-plated dial, caliber 52850 pellaton automatic winding movement with power reserve display, annual calendar with displays for the date, day and month, small hacking seconds at 9 o’clock, approximately 7-day of power reserve, black alligator leather strap. Water resistant to 3 bar. 44.2 mm stainless steel case, 15.3 mm thick, sapphire back, sapphire crystal with arched edge, antireflective coating on both sides, midnight blue dial, caliber 52850 pellaton automatic winding movement with power reserve display, annual calendar with displays for the date, day and month, small hacking seconds at 9 o’clock, approximately 7-day of power reserve, black alligator leather strap. Water resistant to 3 bar. 44.2 mm 18K red gold case, 15.3 mm thick, sapphire back, sapphire crystal with arched edge, antireflective coating on both sides, silver-plated dial, caliber 52850 pellaton automatic winding movement with power reserve display, annual calendar with displays for the date, day and month, small hacking seconds at 9 o’clock, approximately 7-day of power reserve, black alligator leather strap. Water resistant to 3 bar.